Caffeine Crawl Portland anchored a crazy-awesome week of coffee events in the City of Roses, including Coffee Fest, the industry trade show we collaborated with. 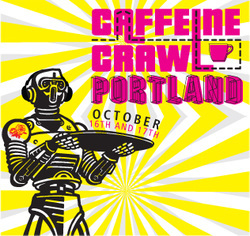 With international visitors and locals alike attending latte art throw downs and educational classes as well as walking the floor at the Oregon Convention Center, Caffeine Crawl offered a venue for exploring Portland's world-class craft beverage culture. Mirroring the city's unique composition, we broke the event into 4 Sessions. 25 coffee, tea, and chocolate businesses participated, and attendees came from as far away as Puerto Rico and as near as Glisan and 28th. At Barista's newest location on Nob Hill, we tasted 4 coffees from their multi-roaster lineup, including Kuma and George Howell. Case Study Coffee downtown offered us a delicious tasting flight of house-made toasted hazelnut and bourbon caramel syrups, paired with single origin coffees. At Nossa Familia Coffee Roasters, we tasted a Cup of Excellence Brazil from owner Augusto's cousin, viewed their Loring Smart Roaster in action, and took home bags of the CoE coffee to enjoy later. Nossa coffee again at P:ear, where our long-time partners Unic had set up a Stella di Caffe espresso machine to facilitate the presentation on impacting homeless youth for the better in many ways, including coffee. Sisters Coffee had a game ready for us: who could match the Nez de Cafe names to vials, and who could identify the brewed coffee waiting for us? The winners went home with bags of coffee. At Seattle Coffee Gear, we were visited by a local TV crew and learned about the flavor variables that go into coffee assessment by tasting various tinctures of organic acids. Steven Smith, Teamaker, welcomed us himself to their lovely tasting room, where we learned about tea production and tasted several of Mr. Smith's current favorites. The weather was crisp and sunny, making for the perfect walking Crawl, for those so inclined. Beginning this Session at sponsor Portland Roasting Coffee's beautiful tasting room and roasting facility, we got an amazing tour and tasted various coffees. (Added bonus: sponsor Earnest Eats showed up from San Diego to hand out their awesome oatmeal cups to ground all our coffee consumption!) At Alma Chocolate, we had a Thai spiced drinking chocolate and left (enchanted) with chocolate skulls to celebrate Day of the Dead. Cellar Door Coffee presented us with two different processing methods of an Ethiopia and a handcrafted honey candy for a fun pairing. At the light-filled tasting room at The Jasmine Pearl Tea Merchants, we tasted any tea our hearts desired and learning about processing and the origins of this PDX-based business. Oblique Coffee Roasters gave us our choice of macchiato or cappuccino as well as an intriguing account of the historical origins of the 1891-era building. At Ristretto Roasters on Couch street, we watched the Steampunk in action under a ceramic cup graveyard. Fittingly, we also visited sponsor Stumptown Coffee's iconic showroom in its HQ off Salmon Street, tasting coffees and examining vintage coffee gear. As afternoon fell into evening, we fell deeper into the heritage and lore of SE Portland's coffee world. What a way to experience it! Kicking off another day of excellent caffeination included awesome giveaways from Bhakti Chai, and Rip Van Wafels to munch. We sampled Ethiopian brew comparisons and a discussion on roasting at Extracto Coffee, with a cascara and coffee tasting at The Arbor Lodge. Caffe Vita welcomed us to their roasting space - an extension of their shop - for roasting insight and samples, and we compared flavors of different home roasting methods at Mr. Green Beans. We enjoyed an educational tea tasting at Townshend’s Tea, and the diversity of options at The Red E Cafe blew us away with coffee in all its forms. Origin comparison at Coava Coffee included Costa Rica and El Salvador, and Portland Roasting had more delicious things in store. A passionate presentation on processing, varietals, and land at origin awaited us at Water Avenue Coffee, and we discussed the origin to barista competition experience over brews at Public Domain. After a great espresso experience at Spella Caffe, we ended a fantastic Crawl with silky drinking chocolate tasting flights at Cacao. We rifled through our event bags from Wholesome Sweeteners, filled with swag from InterAmerican Coffee, Barista Magazine, Yelp PDX, Urnex and FoamAroma. The magic wouldn’t have been possible without the rest of our awesome sponsors - Stella di Caffe, Cafe Nearest You, Good Drinks, and The LAB; and our swag bags came in handy as we headed to Coffee Fest for an afternoon of exploration wrapping up a magical weekend in one of coffee’s greatest cities.